Meet Partiko - The Social Media DApp of the Future! Social media is going through somewhat of a revolution at the moment. The advent of decentralized blockchains have made it possible to create social media platforms that are not controlled by one single party. Currently, the most popular blockchain platform for social media is Steem. It boasts thousands of active users and there are dozens of social media DApps which you can use to interface with it, Partiko being the most popular one. Partiko allows you to earn cryptocurrency in the form of STEEM, just by writing about things that you like. 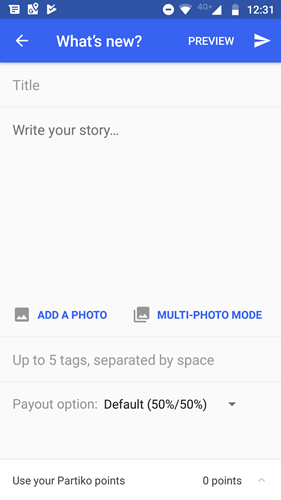 You can share stories and pictures of your daily life, which other people can upvote. The more upvotes you receive, the more you will earn! To get a glimpse of how many users are connecting to Steem on a daily basis, you can check out Steem's activity stats on State of the Dapps. 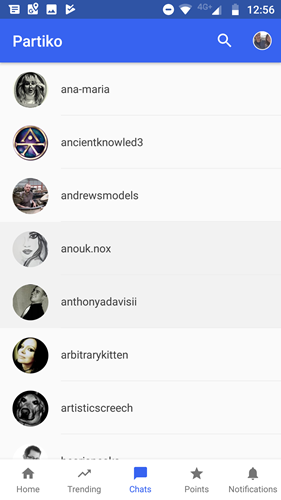 A lot of Steem's active users are using the popular Android/IOS app Partiko to connect with the wider Steem social media blockchain. This is what makes Partiko one of the top social DApps in 2019!. 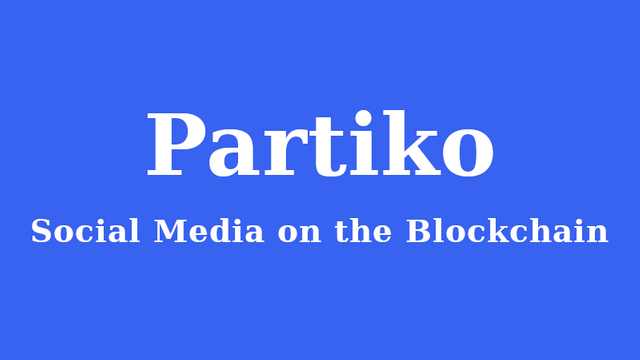 Partiko is available for download in both the Google Play Store and the IOS App Store. After you've downloaded Partiko, you are greeted by the Trending posts on the Steem blockchain. You can view other people's content without creating an account, though you cannot leave comments. To create an account, you tap the 'person icon' on the top right side of your screen. There you will be able to either log-in with an existing Steem account or create a new account. 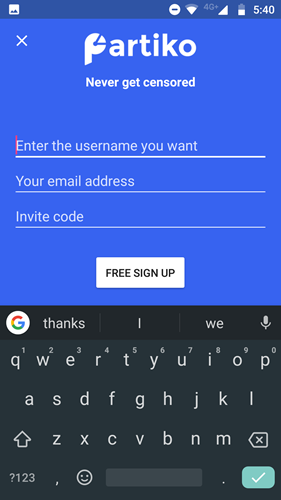 Creating a new account is very straightforward, you just enter a unique username and your personal e-mail address, after which you're good to go! Are you looking for new content? Press the Trending tab (1) at the bottom and sort content by whether it's trending, new or rising in popularity (2). You can also search for content that has specific tags added (3), which allows you to look for specific topics. Once you've found something that you've enjoyed reading, you can choose to give the post an upvote, for which the author will receive some STEEM cryptocurrency in return. When you click on the author's username, you can also follow them to see their future articles in your personal feed (accessible by pressing the Home tab at the bottom). With Partiko, it's very easy to share content of your own. The built-in post editor allows you to easily add pictures and text to your post and you can choose how you want to receive your future payout. Before you publish, you can first look at a preview to see how your post will look. 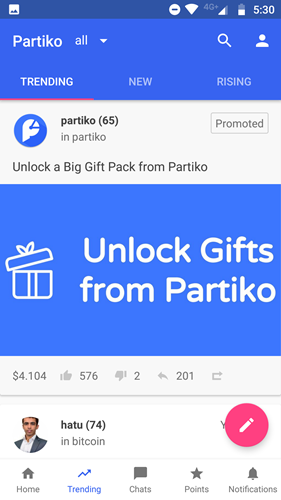 At the bottom of the post editor, you can also choose to spend Partiko Points, which will give you a free upvote from Partiko. 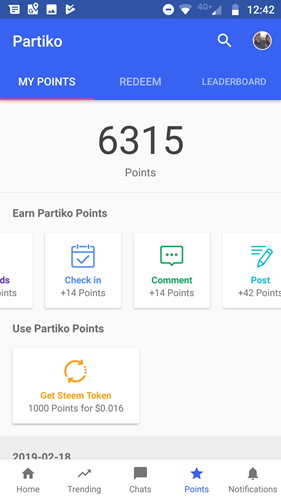 Using Partiko as your main DApp for posting on the Steem blockchain will give you some additional benefits in the form of Partiko Points. You earn points with just about everything you do within the app. These points you can then trade in for upvotes on your own posts. You will earn actual money from these upvotes, in the form of STEEM cryptocurrency. You can easily trade STEEM for fiat currency on many different exchanges. There are some unique features that Partiko has, which you cannot find on the the main Steemit.com website. Partiko offers you a way to chat with other Partiko users, they will get a notification when you send them a message from within the app. The main Steemit.com website does not have a built-in notification system to see when someone interacts with your posts or comments. This is where Partiko shines as a DApp, you will immediately know it when you receive a new comment or upvote on one of your posts. It offers people a great introduction into the world of decentralized applications (DApps), without requiring them to have a technical background. I would say that using Partiko is as easy as using Facebook or Twitter. 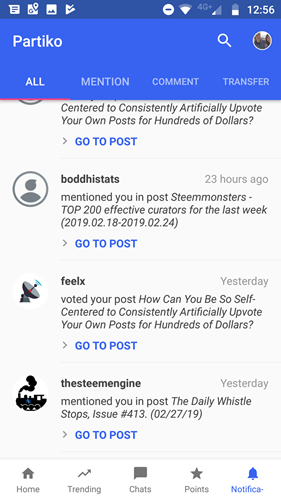 Currently, when you leave a comment using Partiko, it will automatically add a footer to your comment, which can only be seen on other Steem interfaces. I'm not a big fan of advertising in this way and I feel that they should at least offer an opt-out for this. Since Partiko is a mobile application, writing long content is fairly difficult and there aren't that many features to properly format your post. It would be a good idea to add some more basic formatting options to the post editor, without giving up on the ease-of-use that Partiko currently offers. Did you know it's possible to run Partiko on Windows or MAC? Check out this post to find out how! While I was trying out all of Partiko's different features, I've noticed that using this DApp is generally a fun experience. The application on my Android phone worked like a charm and generally looked very polished. No weird hangups or unexplained shutdowns, which is amazing considering that this is a relatively new app. I can clearly see that the team behind Partiko have done an amazing job fine-tuning their application to work on many different devices. I've used Partiko on a total of three different phones (Samsung Galaxy S9 - Motorola G6 Plus - HTC OnePlus) and I've had the same experience on all phones. I am giving Partiko a 4 out of 5 star rating and the only reason I'm not giving a 5 star rating is because of their advertisement footers on comments. Nice post! I love Partiko. It has become my go-to app for accessing the STEEM blockchain on my phone. I like that I am able to do many of the things I usually do on STEEM In a quick and clean interface. Replying to comments when I am away from my desktop is super easy and even collecting my rewards is done in matter of seconds. I love the notifications I get about activity on my blog too. Thanks for sharing this! Yeah, I'm also using it more and more. Usually when I've shut my PC down and I still want to read some posts. The notifications are great indeed! Great review @Daan - I've ben using Partiko since the start of the 2019. It's great and I also wrote a review about it this week. It has some really good features and I can't see me swapping it out with another mobile DApp. Interestingly, you have "Chat" available on your screenshot - I wonder if that is an Android feature - I can't see it on my iOS version. Thanks for sharing. According to this article, IOS users should have gotten the messaging feature before the end of 2018. Partiko iOS users will get the Messaging feature before the end of 2018. We’re working really hard on that! Please stay tuned! Maybe it's delayed or you might be running an outdated version? Thanks for pointing me to this - I have refreshed / updated to the 16th Feb release - I can't see this feature on iOS yet so it must be delayed. Interesting to see & realise that there would be features different on the two versions which I imagine could be quite common on Start-Ups and newly developed DApps and Apps. Yeah that surprises me as well. I don't own any IOS devices myself, otherwise I would have tested it on those too. I hope they'll add it soon though both apps should ideally be the same. I have heard about this app but still did not get a chance to use it. It seems like I should do it as soon as possible. It seems like a great app. You definitely did an amazing job with the review. Thank you for informing us about this app. You are more than welcome. I will sure look into it. Nice review @daan! I "stumbled" on to this app very early on in my Steem "journey," when I first "met" @crypto.talk. It is indeed a great tool! Today I did post my first post with a partiko upvote! It creates a complete new user experience! I started using Partiko this week, loving it! Nice review @daan! Great review and I love partiko too. Only thing that I wonder is why you get 14 points where I get 10... I have about the same amount of points (6134) so it doesnt seem to be a ranking thing.. Any idea? Do you delegate to them? Maybe it has something to do with that? I'm part of the early delegator group. No, that must be it :-) Didn't think of that yet lol.. Anyway, I ended up uninstalling... the notification system wasn't quite what I was after. I'm still searching for something that will let me see the comments that I've not replied to.... sort of like email! Hello! Thank you so much for your feedback! Dark theme is on our feature list and we will let you know as soon as we have it! Also, you can easily go through comments in Pariko. Thanks, but with the commenting.. I had meant something like a filter for unreplied comments both on my blog and others. Often I am 5 days behind on comments and replies, and scrolling down that far is really not so much fun! how to get this application? 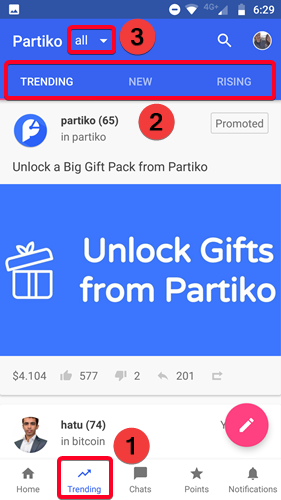 Partiko is available for download in both the Google Play Store and the IOS App Store. You got more than 1500 replies. Your next target is to reach 1750 replies. Congratulations! This post has been chosen as one of the daily Whistle Stops for The STEEM Engine! Your UA account score is currently 4.043 which ranks you at #3599 across all Steem accounts. In our last Algorithmic Curation Round, consisting of 214 contributions, your post is ranked at #38.